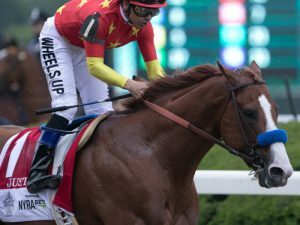 Justify wins the 2018 Belmont Stakes to become horse racing’s 13th Triple Crown winner (photo by Jordan Thomson). There was a good reason why there were only 12. Since Sir Barton in 1919 became the first winner of the three races now known as horse racing’s Triple Crown — the Kentucky Derby, the Preakness Stakes and the Belmont Stakes — only 11 others over a nearly 100-year period followed, names we now recognize as legends in the sport: Gallant Fox, Omaha, War Admiral, Whirlaway, Count Fleet, Assault, Citation, Secretariat, Seattle Slew, Affirmed and most recently American Pharoah.